MELBOURNE, Australia (CNS) — One of the smallest Eastern Catholic churches in the world, the Russian Catholic Church, faces some big issues, including its survival. That’s the issue that will be front and center at a Congress of Russian Catholic delegates from around the world meeting in northern Italy in June. It has been organized by an Australian-based Russian Catholic priest, Father Lawrence Cross, a retired lecturer in theology at Australian Catholic University. The congress, the first in Russian Catholic history, will occur against the backdrop of last February’s historic meeting in Havana between Pope Francis and Russian Orthodox Patriarch Kirill of Moscow. It was the first time a pope had met with the head of the Russian Orthodox Church. Both churches drifted into schism in the two centuries after the so-called Great Schism of 1054. Father Cross explained that the tiny Russian Byzantine Catholic Church was formed by Russian Orthodox who saw the pope, the bishop of Rome, as an essential element for the fullness of orthodoxy. These Russian Catholics, Father Cross says, should be the poster-child for ecumenical relations, living proof that reconciliation is possible. Instead, he is worried they are in danger of being lost to history. “We have saints and martyrs, many dead in the gulags and shot for their Russian Catholic faith. I can’t believe that was all in vain,” said Father Cross. The Russian Catholic Church began in the 19th century with the writings and work of philosopher, critic and mystic Vladimir Soloviev. He spoke against the unhealthy relationship between the Orthodox Church and the state, at that time the courts of Czars Alexander III and Nicholas II. He saw that the only way to end the corruption in Moscow was for the Orthodox Church to find a point of reference for unity and freedom outside itself. This guardian of freedom was Rome. Called “the Newman of Russia,” Soloviev gathered around him a small but influential group of Russian Orthodox and Old Believers to begin the Russian Catholic Church. By 1917, the church had public recognition and a growing number of vocations. But its rise was short-lived. The 1917 October Revolution marked the beginning of 70 years of extreme religious persecution across Russia, only formally ending with the dissolution of the Soviet Union in 1991. During this time, up to 29 million Christians were killed; churches, monasteries, convents and seminaries were decimated. A small community survived underground. This puts the Russian Catholic Church, once again, under suspicion, said Father Cross. 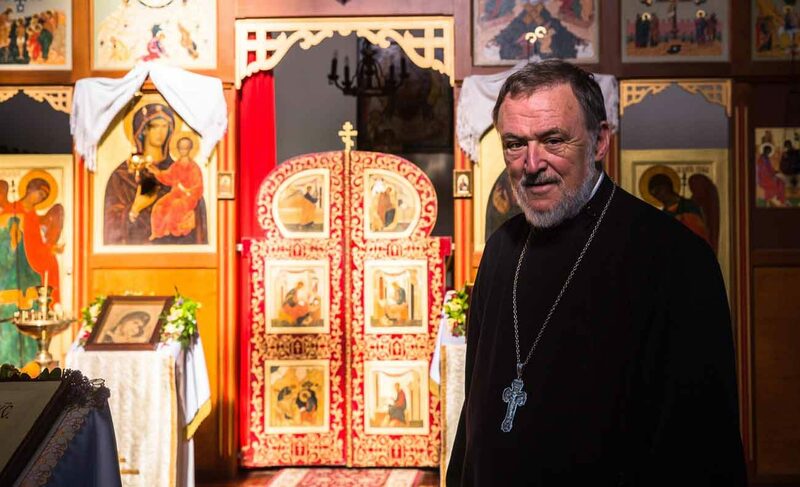 “In the same way that in the 19th century our church was a rebuke to the (Orthodox) Church for allowing itself to become a department of state … now the same thing has happened,” said Father Cross, archpriest of the Russian Catholic Community in St. Kilda East, a suburb of Melbourne. This precarious relationship makes the Russian Catholic community particularly vulnerable in discussions between the Catholic and Orthodox churches. “The truth is we are caught between a rock and a hard place,” said Father Cross, pointing out that Roman Catholic-Russian Orthodox ecumenism may come at the price of the Russian Catholic Church. Those who walk into St. Nicholas Church in St. Kilda East could easily be forgiven for thinking they were in a completely normal Russian Orthodox church. “There will be a much greater impact upon your senses,” said Father Cross: “the candles flickering before the icons, the colors, the smell of the incense, the chanting, the mysterious communication that is going on between the sanctuary and the body of the church. “It is in these things, in beauty, that the divine mystery makes itself present,” he said. Russian Catholic communities also exist in Europe and the Americas, and they have an underground presence in Russia. For the Russian Catholic Church to survive, it needs an above-ground presence in Russia, free of the interference imposed by the Vatican, which placed the clergy under unsympathetic Roman Catholic bishops, said Father Cross. “Otherwise it becomes a museum piece,” he said. He said he has tried to plead his case with the Vatican. In September 2015, he put a letter in the hands of Pope Francis, outlining the plight of the tiny church, faithful to Rome. “The letter ends with two words: ‘Salva Nos’ (save us),” he said. Marsh writes for The Catholic Weekly, newspaper of the Archdiocese of Sydney. Being a Russian Catholic doesn’t mean being disloyal to the Russian nation and its interests. It’s time to let go of the injuries of the past.